This week, family and friends will be gathering together for their 4th of July celebrations. Wherever the celebration is, don’t forget the deviled eggs! There will be picnics in the park, dinners or BBQ's in the back yard or folks opting to cool off indoors gathered around the dinner table. 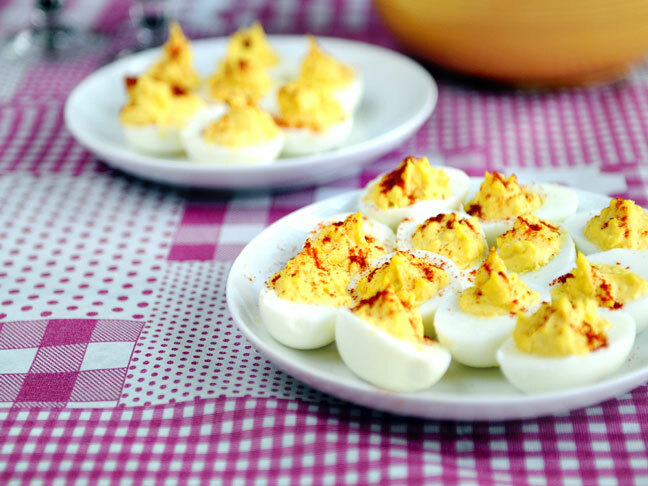 To me, deviled eggs are the must have finger food for picnics and summer celebrations. I don’t know if it is because my mom always took deviled eggs to every picnic we ever went to, but I do know that when we go to a summer party and deviled eggs aren’t on the menu, I’m disappointed. This recipe is a classic, deviled egg recipe. It’s nothing fancy and is incredibly easy to put together. If you are looking for a classic recipe to take to your next summer celebration, look no further. Classic Deviled Eggs are it! Slice eggs in half lengthwise; remove yolks and set whites aside. In a small bowl, mash yolks with a fork. Add the mayonnaise, sugar, mustard and salt; mix well. Spoon yolk mixture into egg whites. Sprinkle lightly with paprika. Refrigerate until you are ready to serve.